The Big Picture: Rebuild completed in many villages and half way to completion in others! NAFA’s focus in 2017 continued to be helping remote villages rebuild infrastructure destroyed by the devastating earthquakes that struck Nepal in April and May 2015. After allocating $400,000 in 2016 towards the rebuild, NAFA allocated another $191,505 towards the second phase of the rebuild in 2017. This could only be done through the generosity of NAFA supporters and our guarantee that 100% of donations to NAFA go directly to Nepal, without any administration expenses taken off. Nineteen classrooms have been rebuilt or substantially repaired with NAFA funds in the remote, eastern Nepal villages of Kophu, Patle, Shyama and Dhupisurke. NAFA executive officers Ross and Brenda Hazelwood joined other supporters to attend official openings of the rebuilt classrooms and were moved by the expressions of gratitude for NAFA’s help from local villagers. In addition to rebuilding their classrooms, NAFA also funded the replacement of school desks destroyed by the 2015 earthquakes in Shyama, Patale and Kophu. In Dhading district, a total of fourteen classrooms were rebuilt in 2017 with NAFA funds in the remote villages of Tawal, Ladap, Richet and Kutal. In the same area, NAFA funded the repair of a village water tank in Tawal Besi and water taps above the village of Tawal. 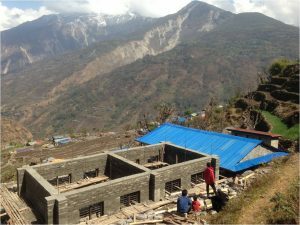 Two gabion walls were also funded in partnership with the Nepalese government, protecting Tawal area school and the village of Tawal itself. These gabion walls had been recommended by a geotechnical assessment for landslide risk undertaken by an engineer at the end of 2015. The second phase of the school rebuild is progressing well in 2017, with official openings planned for November 2018. All of our funded rebuilds in both eastern Nepal and Dhading have been supported by government approved earthquake resistant building plans, earthquake resistant training of local builders and locally-based engineer oversight. NAFA is very confident that we have done our best to construct the strongest possible classrooms for children in those villages. Apart from our earthquake rebuild responses, NAFA allocations spanned the priorities of education, health, child care and rural economic (agricultural) development. All NAFA projects are locally managed and NAFA will continue to expect the local community to make a contribution towards each rebuilding project, for example by undertaking volunteer labour to build retaining walls, excavating and clearing the building sites, transporting building materials from the road heads to the school sites and breaking down stones used for aggregate in the concrete mix. At the same time, NAFA recognises the economic hardship and emotional stress caused by the earthquakes so it will continue to be flexible in its expectations of community contributions during this time. I again travelled to Nepal twice in 2017, focussing on the rebuilding phase and to monitor ongoing and one-off NAFA projects. Executive members Deborah Setterlund, Ross and Brenda Hazelwood, along with other NAFA supporters, also visited NAFA projects at their own expense to monitor project implementation. $191,505 allocated to earthquake rebuild/repair projects in eight remote villages, bringing total to $592,248, after $95,642 was allocated in 2015 as an initial response (e.g. roofing tin and rice). $20,150 allocated to education sponsorship for 47 school children at VSN Thimi. $42,761 allocated to sponsorships for 39 students (VSN Thimi, Tawal and PA Nepal) for college or Bachelor level study. $22,333 allocated to 6 health projects, including salaries for 3 health workers in a remote health centre, primary hearing care, a remote cataract eye clinic, a remote dental camp and a women’s personal hygiene project. $14,867 allocated to teacher salaries in two remote villages and $9,860 allocated to support three child care centres for poor families. $8,684 grant from English Family Foundation to set up a remote area plant/tree nursery and reforestation program and a $10,000 philanthropic donation which increased the loan capital of a remote Cooperative Savings Bank. NAFA has one child sponsorship programs at Vinayak Shiksha Niketan (VSN) School in Thimi, with forty-seven (47) children sponsored for education by NAFA up to Grade 12. This program is now capped due to the administrative responsibilities associated with these programs and their multi-year impact on NAFA’s financial commitments. The students face enormous disadvantages from their backgrounds to continue past this minimum academic qualification to obtain their Secondary Education Exams (SEE). In the case of VSN Thimi, sponsored children are from poor families in this pottery/farming town, with many of the sponsored children’s families working and living in a local carpet factory. Most of the children in Prisoners Assistance (PA) Nepal in Sankhu have parents who are in prison or are orphans. NAFA also provides post Grade 10 FEAT support to students from a number of villages who attend the area school at Tawal. These students are from poor subsistence farming backgrounds. NAFA’s FEAT program aims to partner with child sponsors and families to provide opportunities for young people involved in NAFA supported education programs to undertake vocational training or post Grade 10 (college years 11 and 12) and Grade 12 (Bachelor) study to improve their employment chances. In 2017, funds were allocated through the FEAT program to support 39 students in post Grade 10 study. This number continues to increase as more children formerly supported under the child sponsorship program move into Bachelor level study. Through the FEAT program, NAFA is now supporting young people from VSN, PA Nepal and Tawal to study medicine, public health, fashion design, nursing, education, rural health, hotel management, business studies, mechanical engineering, information technology and network development. NAFA continued its financial support to two child care centres operated by the Butterfly Foundation in Pokhara. These centres support families who have moved to Pokhara from villages in search of casual day labour work. In addition, after funding its establishment in 2011, NAFA continued to support the operation of a child care crèche for carpet factory families in Thimi as a response to an evaluation of the health clinic and child sponsorship programs in Thimi in 2010. Since the earthquake that crèche was relocated to an abandoned primary school and is operating well from that venue. Since co-funding (with AusAid) the construction of the health clinic in 2000, NAFA continues to subsidise the salaries of three health workers at the Tawal health centre, which provides primary health care to over 3,000 people living in Tawal and 4 other nearby villages. Following the earthquake, the health workers saved the lives of a number of injured earthquake victims. Unfortunately, the health clinic at Tawal was completely destroyed by the earthquake and will have to be rebuilt on land away from the landslide prone area on which it was located. A successful crowd funding campaign in 2016 raised sufficient funds to purchase private land and rebuild the health centre. After an exhaustive search, land suitable for the health centre has been purchased and construction of the new health centre will commence after the rebuild of the Tawal area school is complete. In the meantime, the health centre has moved from a tent to be temporarily housed in emergency accommodation rooms built by the Nepal army in case of future natural disasters. Since 2010, NAFA has been a proud supporter of Himalayan Health & Hearing (HH&H), developed and conducted through the dedicated volunteer work and financial generosity of Lew and Sue Tuck from Whitsunday Hearing. Lew and Sue work in partnership with Keshab Dangol from the Nepalese Association of Hard of Hearing (NAHOH), which is also supported by NAFA, and medical staff in Shechen Clinic and Hospice to provide hearing as well as general and specialist health care in outreach camps in the Kathmandu Valley and beyond in remote areas of Nepal. In 2017, NAHOH maintained a strong school program presence in Kathmandu and surrounding areas. Outreach camps were also held in Lumbini and Dhanusha, with a total of 674 attendees, including 383 under 22 year olds. NAFA support for hearing screening and treatment complements NAFA’s commitment to eye care through its long-standing support of Tilganga’s eye screening and cataract surgery remote clinics. In 2017, NAFA co-sponsored (with Joy Foundation Nepal) a two-day clinic in Gorkha on 13-14 October. 1,124 villagers were screened at the clinic, with ninety-five cataract and five minor surgeries performed. In 2017 NAFA was fortunate enough to secure a second grant from the English Family Foundation (EFF), this one being $8,684 to set up a remote area plant/tree nursery and reforestation program for the Pasang Chowk area in the Dhading district. Plants and trees propagated by the Cooperative will benefit local farmers financially, reduce the risk of landslides and replenish wood used for cooking. A $10,000 philanthropic donation was also received and forwarded to a remote Cooperative Savings Bank to increase the loan capital. Interest from those loans will be used to fund infrastructure needed by the Cooperative, helping to make the Cooperative self-sustaining. NAFA and Cooperative members also had the honour of hosting a three day visit from the Director of the Foundation, Allan English and his close colleague, Mike de Guyter. I think we all enjoyed the opportunity to share ideas and learnings as we enjoyed the hospitality and openness of the local community. A women’s social mobiliser (Rebika Tamang) was also funded in 2017 to progress women’s issues in the Tawal area. Rebika started well, helping Deborah Setterlund and Wendy Eastwell with a new tote bag making initiative. Under this initiative, which arose from a six-month sewing training course funded by Queensford College in Brisbane, local women made approximately 180 lined, washable and reversible general purpose tote bags, which were sold through the NAFA network. The initiative was a win-win for both the local women who were paid fair trade wages by NAFA for their efforts; and NAFA making a profit on the sale of the bags, which helps us fund other one-off and ongoing projects. Rebika is also successful in helping the local Cooperative Savings Bank increase the number and level of deposits into the bank. Another new initiative in 2017 was reusable women’s sanitary kits, an initiative driven by Brenda Hazelwood. Six hundred kits, with the liners sewn by a NAFA sponsored FEAT student, were produced and packaged for distribution to women in six regional jails, as well as to students, teachers and mothers in three remote villages in eastern Nepal. In Tawal, Dhading district, Rebika Tamang is trialling sanitary kits for grades 9 and 10 and providing feminine hygiene information sessions. She is also exploring the feasibility of a micro-business to produce re-usable kits within the local community. Finally, jumpers and beanies knitted by women in Brisbane were again distributed to school children in a number of villages. Over 800 jumpers and beanies were distributed to students in earthquake affected villages, including Lumsa, Dhupisurke, Shyama, Kophu, Tawal, Ladap and Richet. As always, the jumpers and beanies were a big hit with local children in those villages. This is the last year for this wonderful program, which has been coordinated by Brenda Hazelwood, due to the difficulty being experienced in administering the program both here and in Nepal. I would like to make some specific heart-felt thank you’s to supporters here in Australia as well as those who have made NAFA achievements in 2017 possible in Nepal. In Australia, I would firstly like to thank NAQ and members of the Nepalese community for again supporting NAFA so well this past year. This support includes substantial assistance with NAFA’s main fundraising events, continued advice on a range of earthquake and bureaucracy related matters. NAFA committee members and regular meeting goers Nirmala Pandeya, Mohan Sharma and Ujjwal Gautam provided sound advice and loyal, consistent support during the year. We missed the usual wise input from Mana Ranjit due to illness but we always knew he was with us in spirit and we look forward to Mana rejoining the Committee and continuing to make a valuable contribution. I would like to offer a special thanks to Gabe Romaguera. He took on the important role of Treasurer in 2017 after Ujjwal had performed that role for eight years. He found it as complex as those of us who have been involved in that area know only too well. But he picked up the reins quickly, and with good cheer. Gabe is interested in all of NAFA’s development aid work in Nepal and will play an important role in building our future. Theresa Buisman and Sushma Waller also provided invaluable marketing support to the committee during the year. Theresa provided general marketing advice and supported the development and presentation of articles for NAFA’s newsletters in particular. Sushma helped, with support from Brenda Hazelwood and Deborah Setterlund, to put a new NAFA Facebook page into action. 2017 was the second year that a number of key management committee members again made an important contribution: Jo Bicknell in the child Sponsorship Officer position, Russ Waller as Secretary, Stephanie Boldeman as Mailchimp/Membership Officer and Rick Parkes as Assistant Treasurer. We are appreciative of their continued, professional efforts. I would also like to take this opportunity to thank Rick and Khilraj Pandeya for coming to Tawal with us in November and providing invaluable support to the NAFA team’s project monitoring efforts there. I would like to again make special mention of the contribution that Ross and Brenda Hazelwood make to NAFA, both in Australia and in Nepal. They work hard in Australia in their formal committee roles but they also help with other tasks that keep everything moving. For Ross, that includes coordinating the preparation of the annual fundraising dinner and Nepal in the Park rosters and equipment requirement lists for both of NAFA’s fundraising events during the year. For Brenda, it includes managing NAFA’s website, being the main contributor to NAFA Facebook and coordinating NAFA’s market stall fundraising initiative. In Nepal, Ross has guided NAFA’s earthquake rebuilding efforts in eastern Nepal, while at the same time supporting Jo with tasks associated with the VSN and PA Nepal child sponsorship and FEAT programs. Brenda very competently supports Ross in his rebuilding and child sponsorship and FEAT efforts, as well as leading other NAFA initiatives such as the women’s personal hygiene project and the craft project at PA Nepal children’s home. They are a great team and NAFA is indebted to them. I would also like to particularly thank my wife Deborah for all she does for NAFA, including the support she provides to me in my role as President. Deb is a very competent Research and Evaluation Officer and that is important in helping NAFA keep abreast of new ideas and in evaluating what we are doing and whether it is making a difference to peoples lives in Nepal. Deborah is particularly passionate about helping remote women have a stronger voice in their communities and improve their health, education and economic well-being. Thank you Deb for all you do. NAFA market stalls are a reliable fundraiser for NAFA, with over $13,000 raised in 2017. It is great credit to those involved in purchasing the items and organising the market stalls, including Brenda Hazelwood, Debbie Leigh, Deborah Setterlund, Megan Richardson and Wendy Eastwell in particular. Megan consistently raises between 15-20% of our market stall income from a small town in New South Wales and this was achieved again in 2017. Her energy, commitment and loyal support to NAFA is again appreciated. Other NAFA management committee members help with NAFA’s main fundraising events and with other important management and administrative tasks. I would like to again this year make particular mention of Peter Brockett and Stewart Jones for their expertise and good cheer in undertaking important tasks associated with NAFA’s two main fundraising events, the Nepalese New Years fundraising dinner in May and Nepal in the Park in August. Finally, I would like to thank Betty Harris for your ongoing support to NAFA as a committee member. When she is not travelling in far away places she is a solid contributor to NAFA’s decision making processes. In Nepal, our Project Coordinators volunteer their time to help their communities. It was another busy and challenging year for them: Phurba Sherpa for the Solu Khumbu/Okhaldunga/Dolakha districts; Chandra Tamang and Kanchha Tamang for NAFA supported villages in the Dhading district; Surendra Prajjapati in Thimi; and Govinda Pahari in Pokhara. Thanks also to Pratika Shakya and Uttam Shrestha for providing administrative and IT support to NAFA from the Joy office. Pratika also joined Deborah and I for one of trips to Tawal and there provided invaluable translation and rural development support to us during our field visit. Manish Bhadra, HOD Administration of the Speedway Foundation continued to provide invaluable support in liaising with school rebuilding committees in eastern Nepal and helping guide NAFA through the Nepalese bureaucracy. In 2017 NAFA committee members and regular meeting goers, led by Russ Waller and supported by Rick Parkes and Mary Hockaday, continued a planning process for succession and sustainability for the day sometime in the future when Ross, Brenda, Deb and I will no longer be able to undertake the activities we do here in Australia and in Nepal. A new organisational structure has been approved by the Committee and will be implemented from this AGM. In broad terms the structure separates the “operational”, project-related tasks in Nepal with the more managerial and administrative tasks back in Australia. Two volunteer positions included in the new structure are a Nepal-based “Project Coordinator” for NAFA and “Project Champions” focussing on specific project areas. Bijaya and Binu Rajbhandari have offered to take those roles, Bijaya in the role of “Project Coordinator” and Binu as “Project Champion” in relation to child care crèche and other social work initiatives. I have been President of NAFA for eleven years (but hey who is counting). As I indicated at the 2016 and 2017 AGMs, I would like to stay in the position until the rebuilding phase is over. We are nearly there. I fully support the “succession planning and sustainability” process and have prepared a number of documents in support of that process. If you would like to take up a position that I have been honoured to hold, please step forward and I will be very happy to support you. NAFA is a very special organisation. It took courage and trust to take on the commitments we made after the earthquake. Those commitments will be met thanks to expertise both in Nepal and here in Australia, determination, collective generosity of NAFA’s supporters and okay, maybe a little luck. If we plan and implement our succession planning well, NAFA will continue to make a real difference to people’s lives in Nepal for many years to come. In the meantime, let’s celebrate what hopefully will be the completion of the very ambitious rebuild commitments NAFA made after the earthquakes.